With Europe reporting GDP, reactions have been somewhat varied. In some places, it was taken as not as bad as feared, while others were downright cheered by a lack of total collapse, as if that is now the standard for economic progress. Since GDP tends to be noisy in the short run, the major components, the economic base, continues to show anything but more of the same. There was nothing, to my mind, in the GDP report that indicated an inflection away from stagnation or slight decline. 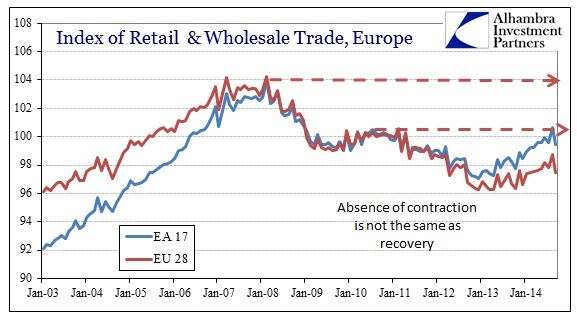 That is perfectly in-line with the trend that has unfortunately developed since midyear, pushing the ECB toward outward desperation. 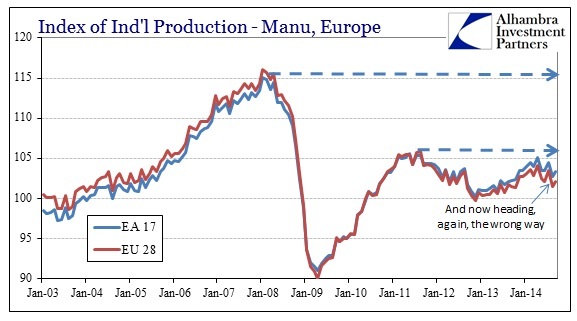 The most striking aspect of the European economy post-2007 has been lower cycle peaks at every juncture. In industrial production and trade, the “recovery” after the initial blast of the Great Recession never came close to matching pre-crisis levels. Now after another “cycle”, the peak is yet again below this time even 2011. What we see, then, is no recovery at all but rather an ebb and flow in an otherwise downward direction toward full-scale depression. 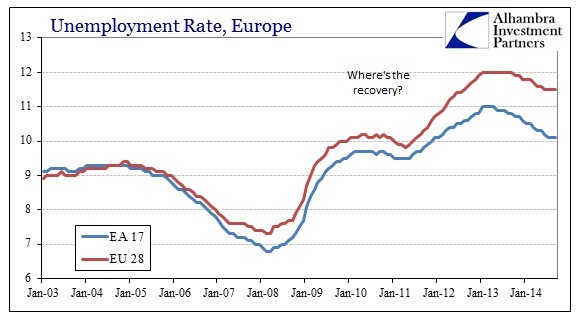 Unlike the US, there is no participation “problem” in the European unemployment fraction, so they cannot even hide from the fact that unemployment is the most visible signal of what I described above. Eerily like the 1970’s and the Great Inflation, after each and every “cycle” completes the level of unemployment is left worse off. That is particularly true of the wider Eurozone which hints at the geographic divide. In one important sense, that may not be surprising, except maybe how short a time these “cycles” are now condensed. The one commonality between the Great Inflation and now is monetary error of an immense magnitude. As if to prove the point being played out in Japan, it does not matter if it is “inflation” or “deflation” instability is all the same and works toward decay regardless. I think that is the message credit markets are receiving and sending themselves. This week saw quite an outsized move in Swiss credit that I believe highlights this growing nervousness and unease about direction in the real economy, to ultimately impact euro finance. That fear gets amplified by the economic existence I described above; there should be growing caution in such ultimately decaying cycles despite a preponderance of monetary intrusion. If the direction is quite established by now, then the ECB has been shown powerless to stop it. 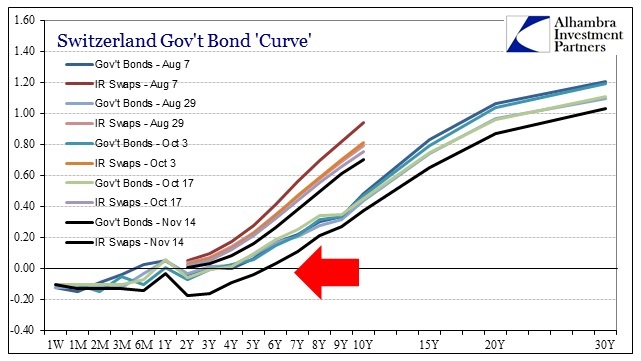 The Swiss bond curve is negative all the way out 5 years now! Beyond that, the curve is as flat as it has been since 2011, which suggests this growing credit market fear. That observation is complicated somewhat by the occurrence of the gold referendum in Switzerland, which some claim is driving the big changes here; I don’t think that to be the case. That doesn’t meant that I don’t think the gold issue is a factor, quite the contrary, only that it is secondary and may explain part of the magnitude but not the initial direction. The first corroboration of the down economy explanation is in Swiss swap spreads. 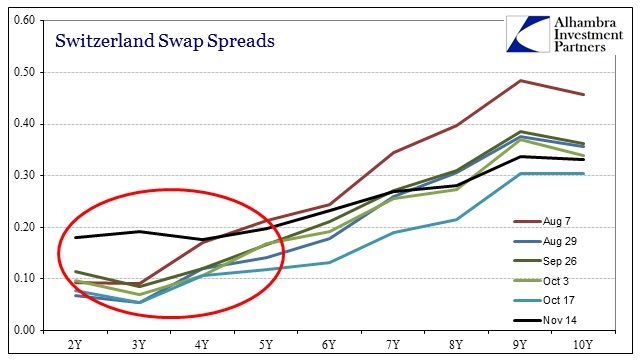 As in the past where the peg has been threatened, swap spreads decompress significantly indicating an opposing stance from the cash market. In other words, Swiss gov’t bond yields are expecting even more “flow” into the franc and the swap curve expecting the SNB to do something about it. That doesn’t suggest, to me, any direct issues with gold. 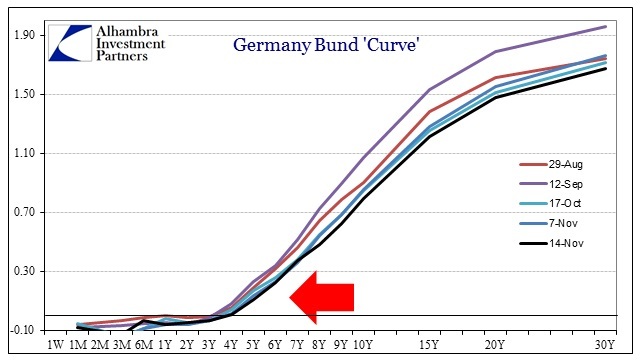 Then there is the German bund curve which has also flattened more than a little this week, clearly unrelated to Swiss gold. The German 10-year is now under 80 bps which is, if you stop and think about, wholly astounding and more than a little pessimistic about Europe’s economic track and the ability of the ECB to monetarily counteract. What clinches the economic explanation for me, however, is Denmark. The Danes also have, like Switzerland, their own currency alongside a close economic and financial tie to the rest of Europe. 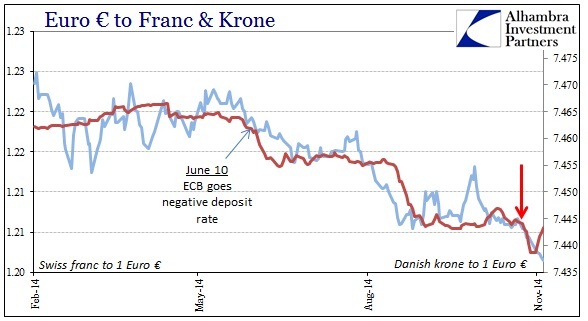 And also like the franc, the krone in 2011 appreciated against the euro (and Danish bond yields fell negative) in what was clearly a search for protection against, or hedging for, significant and potentially fatal euro currency problems. 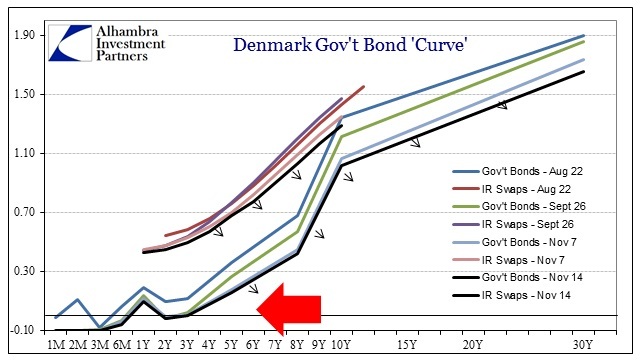 The Danish bond curve (and swaps for that matter) is behaving almost identically to the Swiss curve – save the magnitude. The franc had moved mostly sideways against the euro until then; as did the krone. Both behaved in tandem before and after Nov 3 (apart from the past two days), which, again, would seem to preclude the Swiss gold referendum from figuring as the primary motivation. Like credit markets in the United States, credit and currency in Europe is not only dour but growing more so across the continent. This week has not been a good one in that regard, as credit has accelerated its pessimism despite all proclamations and central bank “actions” to the contrary.